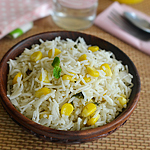 I make Corn Pualo often atleast once a week for mittu alone as she loves sweet corn and this pulao is her favorite.Mittu loves any white pulao like veg pulao,peas pulao etc….You can even add methi,peas along with corn for this pulao.You can check out peas corn pulao that I had already posted. 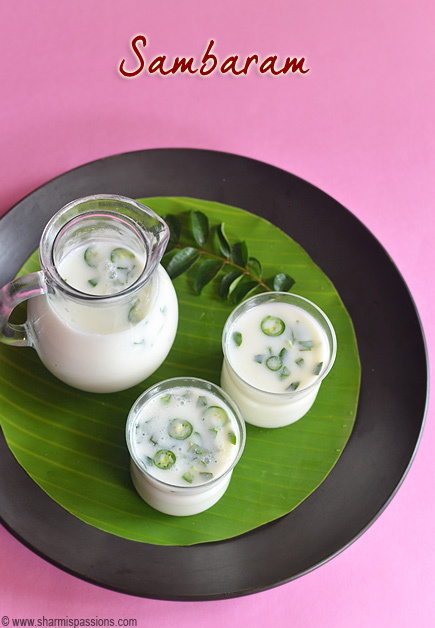 Rinse basmati rice and soak it in water for atleast 15-20mins.Grind pepper and elachi to a coarse powder….I used my hand mortar and pestle,Set aside.In a pressure cooker heat oil + ghee – temper the items listed under ‘to temper’ let it splutter then add pepper powder. Once it bubbles up and crackles add ginger garlic paste saute till slightly browned then add onion and saute till golden brown.Then add mint leaves give a quick saute then add corn and required salt.Give a quick stir. Drain water from soaked basmati rice and add it.Mix well and add water and pressure cook in medium low flame for 3 whistles.Once the pressure releases open, add a tsp of ghee and give a quick mix.Fluff it up with a fork. Serve hot with any of your fav curry.We had it with gobi curry. Make sure you soak the rice for atleast 15mins….it will give nice fluffy, soft separated rice perfect for pulao / fried rice too. Adding mint leaves gives a great flavour. 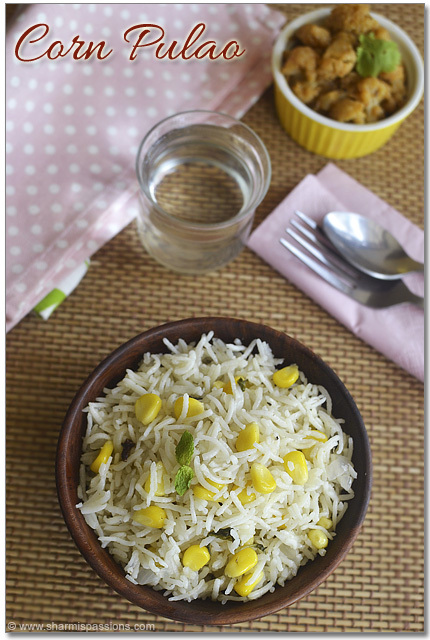 You can even add 2 tsp cashew paste for a rich pulao. 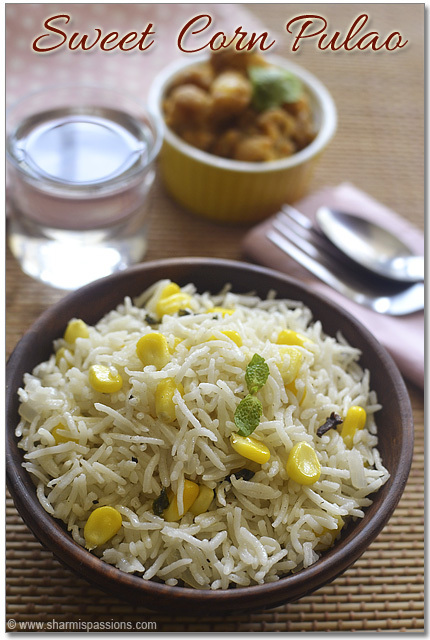 Dont compromise on ghee and oil here else rice would turn sticky. I used frozen corn,you can use fresh corn kernels too. I always grind pepper elachi powder in bulk and use it whenever needed that way it saves time too. 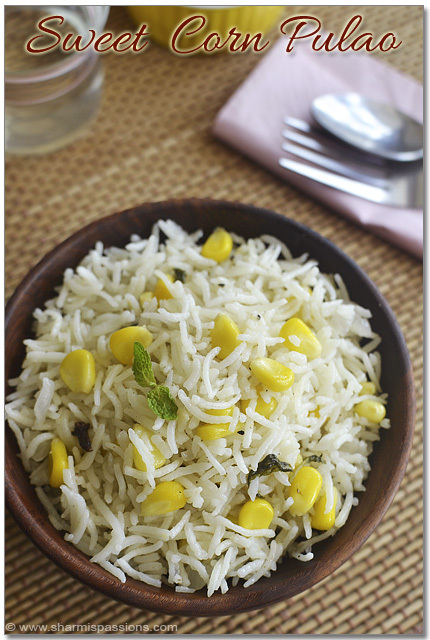 I use India Gate basmati rice…have tried all varieties in it and currently sticking to Tibar. Cook in medium low flame to avoid burning at the bottom. 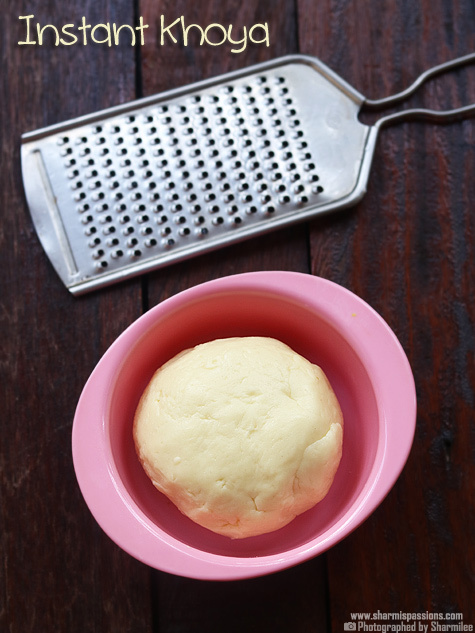 You can even temper the items using butter. Just fluff it up carefully with a fork after opening without breaking the rice. 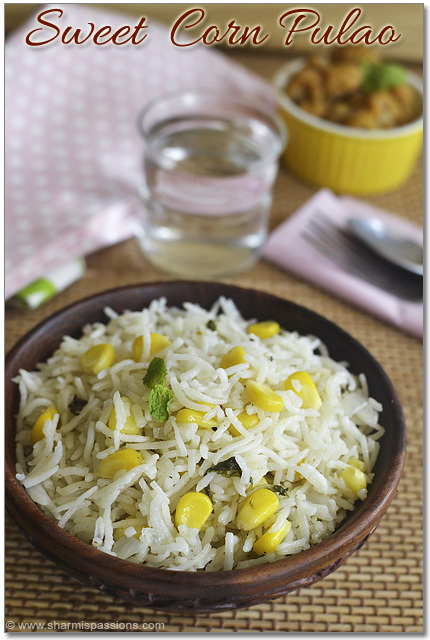 Sweet corn pulav looks yummylicious !! 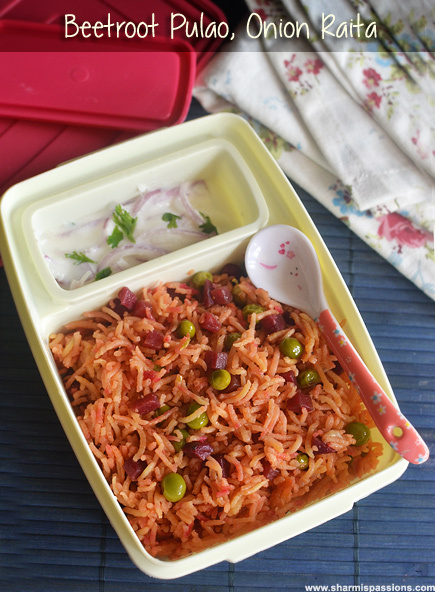 Very light & flavorful pulao, a perfect kid's meal..looks lovely sharmi! 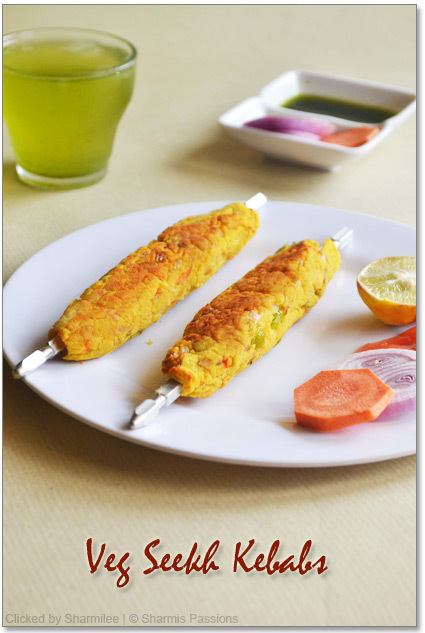 In this receipe u can add some fried cashewnuts also gives more taste . I tried it nd its very tasty. 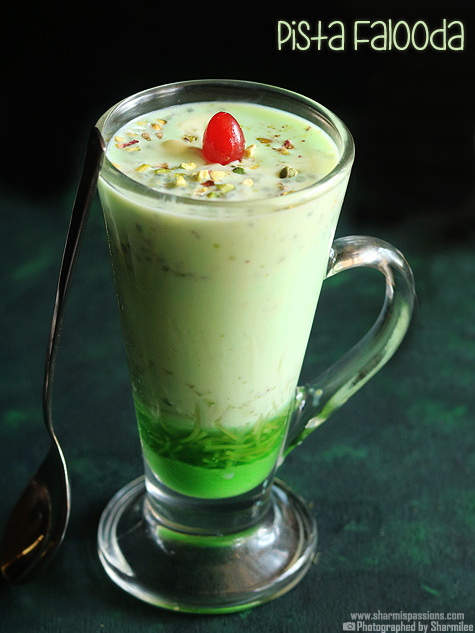 Did you use badi elaichi or the small green cardamom? 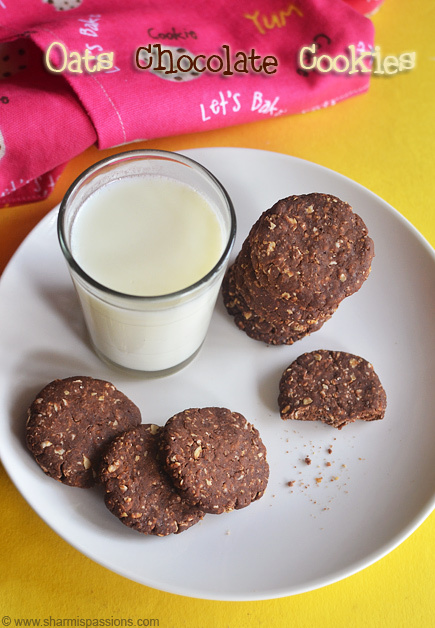 Hi, I tried out this recipe and it was easy to prepare and very tasty.. Thank you! Thank you for this tasty recipe. Everyone at home loved it.